Cooperative Extension is a non-formal U.S. educational program, established in 1914, designed to help people use research-based knowledge to improve their lives. In most states, educational offerings include agriculture; food, financial, and/or family issues; the environment; community economic development; and 4-H youth programs. Funding is provided by the federal government in cooperation with state, county, and/or city governments and land-grant universities. #30DaysofSavings Social Media Project: Cooperative Extension received a grant from the Consumer Federation of America to promote savings and the America Saves Week 2019. 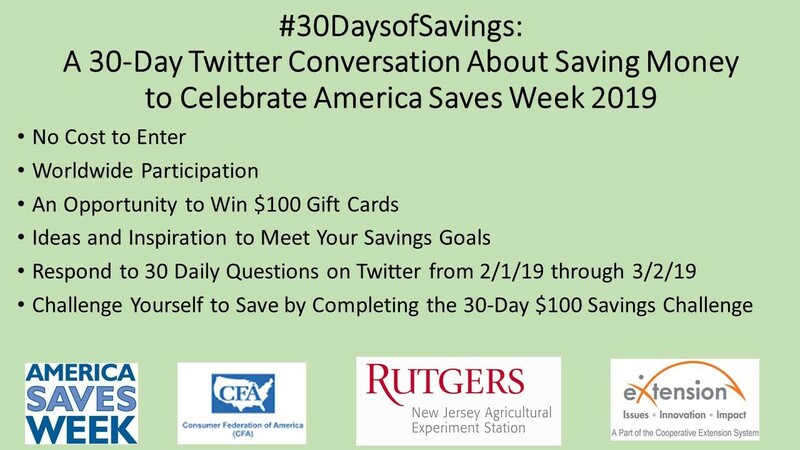 The goal of this project is to encourage people to enroll in America Saves and learn about saving through a 30-day-Twitter “conversation” using #30DaysofSavings. A different question about saving will be asked each day from February 1 to March 2. People also will be encouraged to complete the 30-day $100 Savings Challenge. Upcoming Webinars: eXtension sponsors a monthly webinar as does the eXtension Military Families Learning Network Personal Finance team. Previously presented webinars are archived for later viewing. Visit the Land-Grant University Website Directory to find the Cooperative Extension land grant university in your state. From there, click on a state Cooperative Extension website to find local offices in that state. View more than 100 Military Families Learning Network Personal Finance team archived webinars. Visit the eXtension Personal Finance webpage for personal finance content and resources. View additional archived Extension personal finance webinar recordings and YouTube Live events. Follow @moneyeXtension for the latest tweets from Extension professionals. Review the logic model for documenting the impact of Cooperative Extension personal finance programs. Cooperative Extension helps people use research-based knowledge to improve their lives. Find out more about Extension personal finance programs and resources at https://articles.extension.org/personal_finance.